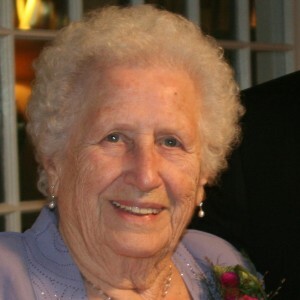 Eleanora A. Williams, 91, died Aug. 29, 2013 at Fort Hudson Nursing Home, Fort Edward. Born in Worcester, Mass., on Dec. 4, 1921, she was the fourth child of Carl O. and Aina (Eriksson) Engstrom. Eleanora was the wife of William J. Williams (d. July 18, 1980) and the mother of three children – Russell J. (Marsha) of Slingerlands, N.Y.; Virginia L. Ransom of Hudson Falls, N.Y.; and Rebecca L. (Richard) Wilhelm of Brant Lake and Clarks Mills, N.Y.
She attended high school at David Hale Fanning Trade School for Girls, graduating as a journeyman printer. Her later employment was for The Whitehall Times, H.E. Beckwith & Son, the Whitehall Coat Factory; and General Electric, from which she was retired in January 1986. Beyond physical strength and a strong will, Ellie was an enduring wife, mother, and friend; and a firm and reliable guide to her children. She was a special resource and loving grandmother to four grand-daughters, Johnna L. Hill, Peru, N.Y.; Jennifer L. (Chris) Yates, Saratoga, N.Y.; Amrys O. Williams (Paul Erickson), Middletown, Conn.; and Erin E. (Bill) Hogan, Malta, N.Y. She taught them to plant, harvest, pick berries and apples, to cook and bake, sew, stitch, crochet, knit, and quilt. The family favorite is pies. She was renowned for her Swedish pastries and cakes, fresh picked berry and apple pies. Ellie was also great-grandmother to four boys (Logan, Bryce, Flynn, and Teague). A creative and active member of the Northern Lights Quilters, displaying at the annual quilt exhibit in Brant Lake, she attended quilting schools at Star Lake, N.Y., and elsewhere, and often quilted with her youngest sister, Muriel (Rochdale, Mass.). Ellie was of the Methodist faith, and held membership in Farm Bureau; was a Matron of Eastern Star and a life member of the Whitehall Grange #922 – a woman to rely on to get the job done. Ellie responded promptly to human need in her community, helping others when their need was greatest, often in secret whether with family members, other women, or on her own. Relatives and friends may call Thursday, Sept. 5, from 3 to 7 p.m.; A funeral service will be held on Friday, Sept. 6, at 11 a.m., at the Barton-McDermott Funeral Home, Inc., 9 Pine Street, Chestertown, NY. Interment is Saturday, Sept. 7, at 11 a.m., at CedarGroveCemetery, Fair Haven, Vt. Donations in memory of Ellie Williams may be made to C. R. Wood Cancer Center Image Fund, 100 Park Street, Glens Falls, NY 12801.